Elena Policante, young woman volunteer from Horyzon Switzerland (YMCA/YWCA Switzerland). Elena comes from Switzerland and is volunteering with the YWCA and YMCA movement in Palestine as part of a three month programme. I think the first week in a foreign country is always special. You have to get used to many things like: language, culture, driving habits, temperatures and of course a lot of new people. My first week was really diversified and interesting (maybe a little bit too much), which ended in a bad headache in the middle of the second week. But this is a luxury problem and I don’t want to complain about. Except from a few questions and vicious looks, we didn’t have any problems at the airport. The flat was small but really comfortable. Who could complain if the supermarket, which is open until 1 pm., is right next to his house? ;) We were recognized as the “new neighbours” at our first walk through Beit Sahour. Ibrahim from the Joint Advocacy Initiative (JAI) showed us the office and drove us through Beit Sahour afterwards. He showed us the Alternative International Centre (AIC), the Alternative Tourist Group (ATG) and a house that got hit by a bomb from the Hamas. We had already made the most important purchases in the evening and could thus enjoy a good breakfast on the second morning already. We walked to the JAI office, where we discussed our plans with Nidal. After that I went with Ibrahim to the YMCA, where I was scheduled throughout the week at the Rehabilitation Programme (REHAB). They introduced me to many different people and I could already accompany one of the field workers to four different clients. 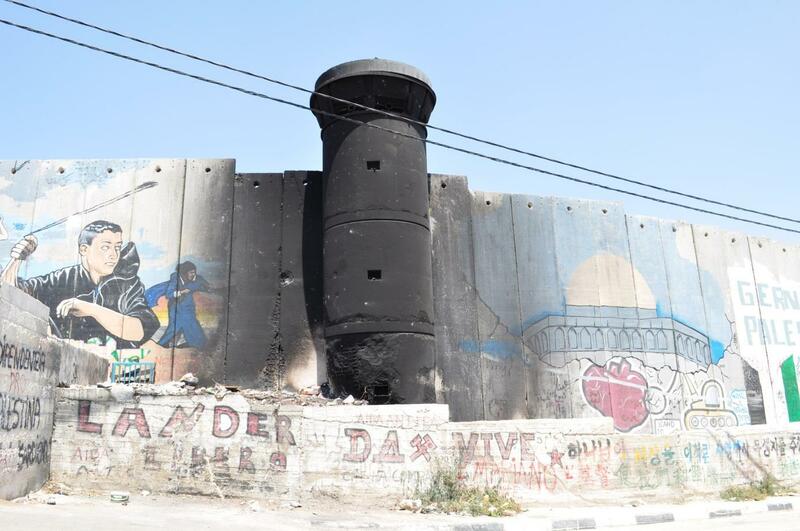 It was the first time I saw an Israeli watchtower and smelled the stink of the chemical water. At 8.30 am I started my day at the YMCA. I was able to accompany another field worker. 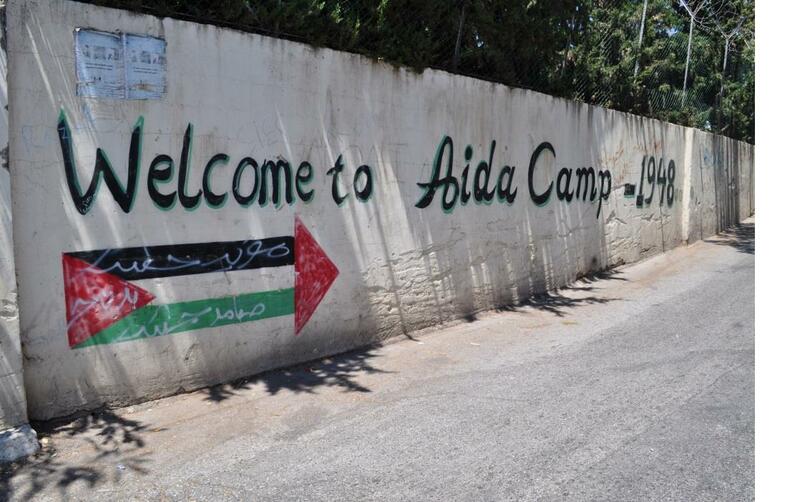 It was my second time at the Aida Camp and I saw a black watchtower. It was burnt and destroyed by children from the camp. Afterwards we went do the Deheishah Camp. My head was totally full with new pictures and impressions. In the evening we went to the AIC and watched “Tears of Gaza”, a really impressive film! Today, we did a little bit of tourism. At 9am we took the Taxi and drove to the Herodium, Salomons Pools and the Gate of Saint George. Afterwards we walked through Bethlehem and tasted some local delights including an array of various types of Hummus, Olives, Pita bread, Salad and other things. We also went to the Stars&Bucks, which is an amusing and delicious imitation of the well-known Starbucks. At the evening we went to the Sports Center to watch the final of a family soccer tournament. There were a lot of people around and even though we didn’t understand everything, it was really funny. Today, I accompanied another field worker we went to a family in which the 14 year old son got shot by an Israeli soldier. Even though I didn’t understand a word, all the feelings in the room were really intense. At the evening Markus and I went to the Singer Café in Beit Sahour and drank a Chai Latte and a Lemon Mint Juice. This is a really recommendable place; a good spot to debrief and reflect on the days events. 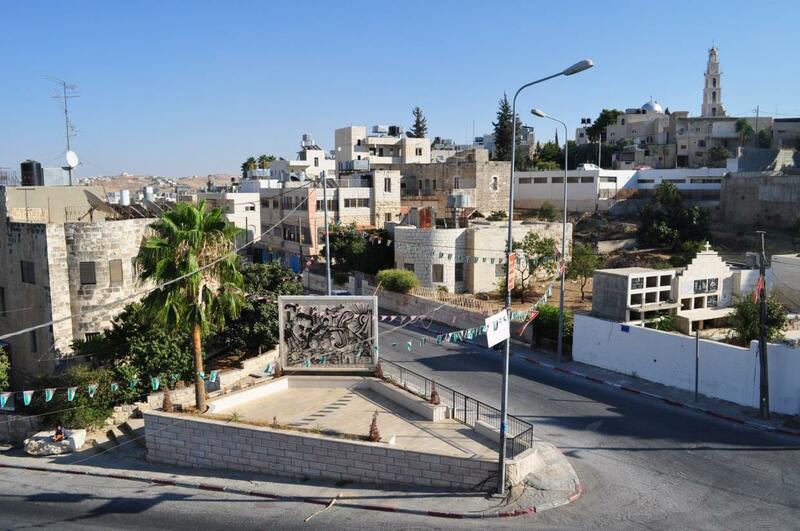 The first week in Beit Sahour had already passed by. I tried to sleep in but it didn’t work. I woke up at 8am because of the traffic and the sun. I went to the office. A driver brought us to the YWCA of Palestine in East-Jerusalem. We had a meeting with Mira, GS of the YWCA and Mayadah, Office Manager about the UNSCR 1325 conference in the end of September. After three hours of talking we went to the old city of Jerusalem. In the evening we went to the AIC, there was a lecture from Nurit Peled-Elhanan on the topic of “Palestinians in Israeli school books”. My head almost exploded with all the information and the realization of the level of propaganda but it was really interesting. In the afternoon I accompanied one of the field workers into a village, which lies in between three settlements. Afterwards we went to the Al Azza Camp (the third Camp in one week). At the evening I got a bad headache. I wrote letters and lay around, hoping the headache would disappear. The next few days I spent in my bed, because of the headache. I think it’s important to take sufficient time to digest the information and always debrief with someone close.